The thing about purple is that it’s so…. well, peaceful in many respects: the purple in a flower, in a sunset, in the underbelly of a rainbow. I have those sorts of purple. But here’s a less than peaceful purple, although I have all the above, that speaks to a very different emotion: flat-out-yahooooo! laughter. 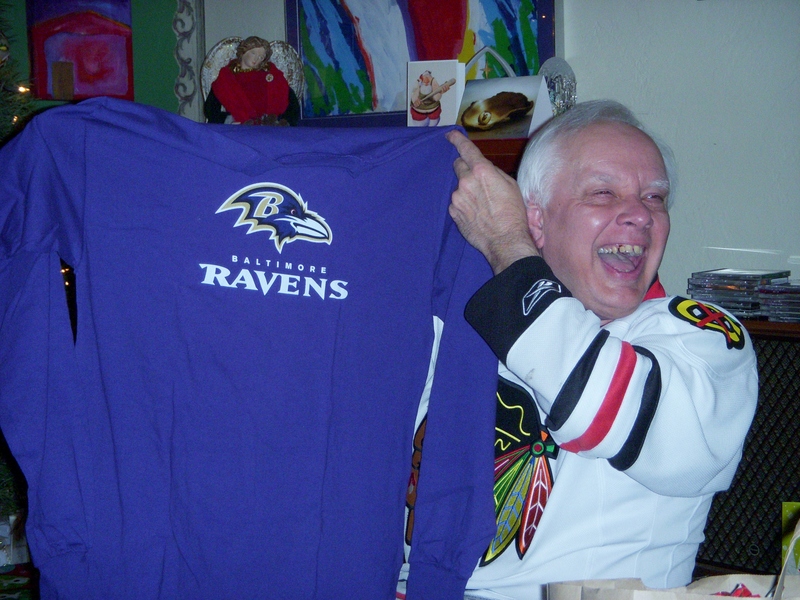 Here is my husband, upon receiving a long-sleeved tee-shirt for Christmas with his very favorite Baltimore Ravens emblem and colors. Interesting. Thanks, Valorie. It does indeed. I have always associated purple with Personal Power…in which case that grin on Cliff’s face works just grreat!